Dan and I celebrated our first wedding anniversary on Saturday. We like the idea of traditional gifts... and the first year is paper. We were both stumped and perplexed for a little while... and then my creative side came out. 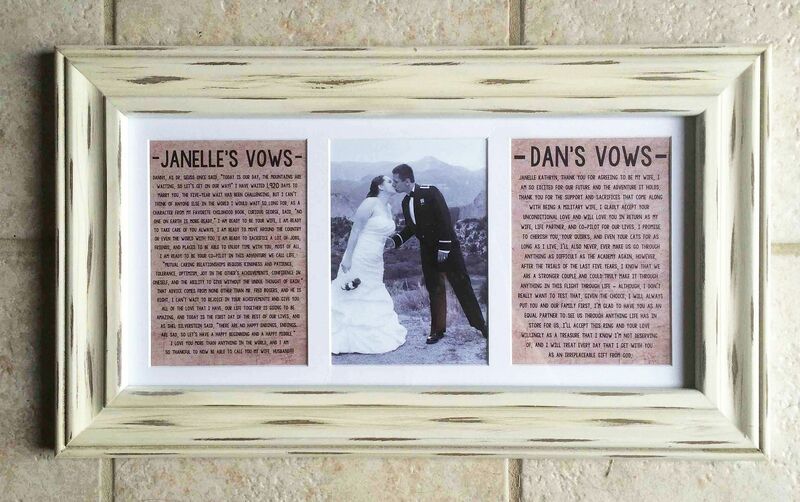 I ended up typing out our wedding vows to each other on Photoshop and printed them out in 5x7 size. I trimmed off the excess white border, and put them in opposite sides of a three window frame. For the middle window, I had to include a wedding photo, of course! I chose one of my favorites, made it black and white, printed it to 5x7, and trimmed the white border. I made sure to print all three on cardstock to play it safe... that counts as paper, right? How did you celebrate your first anniversary? What's your favorite anniversary gift yet? hi! i'm rebecca and just started blogging at MORE OR LESS. i love your anniversary gift idea! for our first anniversary we didn't follow any traditions other than eating cupcakes which we had at our wedding! enjoy the concert! Oh my goodness! How stinking adorable! I actually was a bit scandalous with my gift and had a boudoir photo shoot done and got a album made for him. Needless to say he loved it! That's a great first wedding anniversary gift! I love the vows typed up. How lovely! Tom and I usually exchange cards. He usually tells me I can go get something at Target. Or a book. What a fantastic and creative idea! I sort of wish we had gone the traditional route! Such an awesome idea!!! :) I am horrible when it comes to gifts, we normally don't get each other anything, sad I know. Love what you came up with! That's fab!! And tickets to the Rolling Stones? Hello! Awesome!! I kind of wish we had followed the traditional gifts...but now we are 4 years in. This is so cute! And yes to the Arrowhead concert venue! That will be awesome!